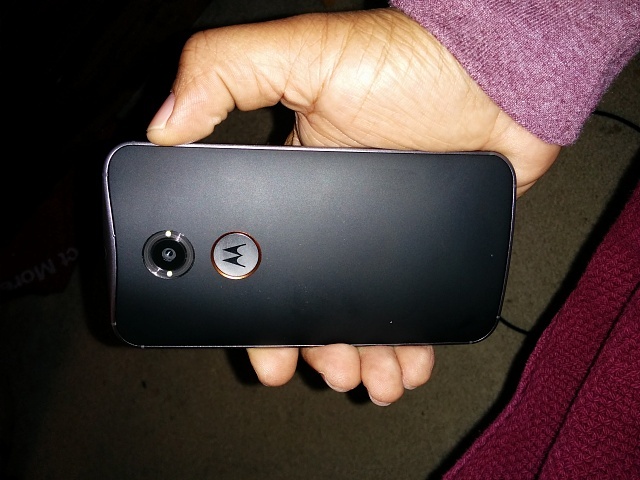 So I was one of the lucky ones to be able to get a cyber Monday promo code and I bought a Moto X. Coming from a Nexus 5 I have to say I'm underwhelmed. To me the screen on my N5 is better and I really do prefer a notification light to the active display on the Moto. 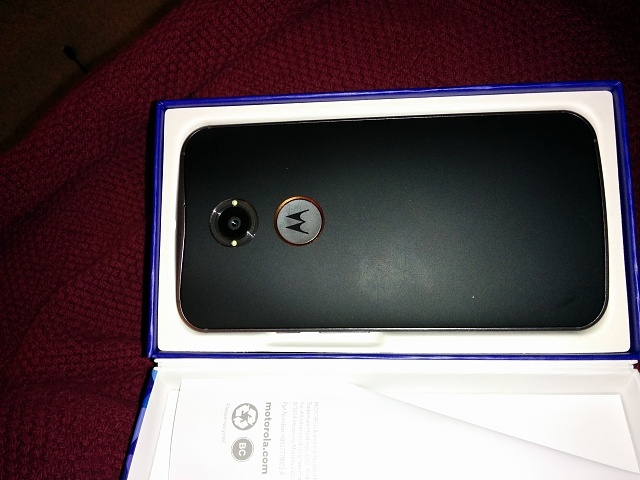 So goodbye little Moto, it was nice knowing you but you're really a step up from my Nexus. Holy crap I didn't realize how bad the camera on the Nexus 7 really is. Still a great table tho. The Moto X (2014) is an awesome phone but I agree it's not really an upgrade over the N5. I view it as a side grade. If you want a new phone and you want a slightly larger screen the the Moto X is a nice option. I sent one X back because of very bad pink tinting on the screen and am waiting for the replacement to ship. If it has issues then I will just send it back and use my N5.. I had a Nexus 5 and sold it. I would get this strange battery drain that was very annoying. I can't say for certain whether the Moto X battery life will be better. I'm on Lollilop, and it's not a fair comparison with 4.4.4 that I used with the Nexus. Still, in the 5 days that I've had the phone, I haven't experienced any battery drain, and the battery life appears to be more than enough for me. I prefer AMOLED screens over LCD's and happier with the Moto X screen over the Nexus 5. I like the Active Notifications on the X. I tried Dynamic Notifications on the N5, but it was buggy. I like the always listening and twist gesture to open camera. I do miss the notification LED's on the N5. That's a feature I wish the X had. I agree that the X is not a huge upgrade over the N5, but overall, I prefer it over the N5. Sorry you didn't like the Moto X, but it's great that we all have options. I have both a Nexus 5 and a Moto X 2014, and I totally agree. The Nexus has a far better screen, the X's is grainy and turns purple at low brightness, and the $400 I paid for it is just not worth it compared to the $225 I paid for a used Nexus 5. I plan on returning it or selling it, which is a shame since it really is such a great phone in so many regards. Sorry to hear it did not work out for ya! I love mine and I paid full price for the PE 32 gig. So will you be sticking with the N5? I am still waiting on a replacement, I just wanted to see if the screen was especially bad on the original. I really want to love it, so if the screen is better I may keep it, but most likely I'll be returning it. I am something of a screen snob, and I expected the technology to improve more than the Galaxy Nexus that the display reminded me of. I'm going to sell the N5, it also is lacking, but this time in build quality (I'm picky...), so I am using my HTC One M7 GPe, which is a fantastic phone. I got my Moto X on the Cyber Monday sale, but as a teenager, even $360 is a huge sum to me; so perfection is a must. Anyway, how is your display? Is it grainy looking or was that a problem with mine? In my case, I don't find the screen "grainy" at all. The screen density is well beyond what my 40-something eyes can discern and everything is crystal clear. It's a 1080p screen in every way I can imagine. But, as you've stated above, you're a "screen snob", so your criteria may be different from mine. Hope the new one works out for you, but you gotta go with what you love if not. Of interest, I actually see the Moto X as a semi-upgrade over the Nexus for the sheer fact that the Moto X kicks the pants of the Nexus 5 (and almost any other phone available right now) with regards reception. Standing in the same location with both handsets, the Moto X reports on average -5 to -9dBms more than the Nexus 5 and that is something IMHO. I love my Nexus 5 and I consider it to be 1 of my top five smartphones of all time, if not the top phone of all time for the sheer value proposition alone, but Moto has always been the reception king and their new radio tuner (developed in-house) is impressive. No matter how hard I try to de-tune the device, the tuner compensates and the Moto X does not take the signal hit that my Nexus does or for that matter any device I have messed with. At one of my employer's test sites (out in the desert) we colloquially call it "cell death valley", my Nexus 5 would grab and loose the at&t signal all over the property. With my Moto X (which I just had an occasion to test) it was able to reliably hold onto at&t's 3G (HSPA+) signal over large swaths of the property while a colleagues at&t branded Galaxy S5 was only able to reliably get a 2G signal and if he was lucky a 3G signal if he was standing in just the right place. So, while I still love my Nexus 5 and will use frequently, my Moto X will be my travel phone and daily driver. Same here. I got my Moto X last week and i am returning it. IMHO i dont think its a big enough upgrade over the nexus 5. The Moto Active Listening is not that great. There are times when it flat out does not work. This weekend when i was trying to text someone while driving the app would open and just sit there. Other command like launching the a music player, the app would open but will not play the artist that I asked for.. Its hit and miss on this app. The range (voice command) is very short meaning that I have to be on right next to the phone in order for it to work. One thing i miss on the Moto X is a custom rom. After finding out there my favorite rom (Nexus 5) has been upgrade to 5.0 is when I decided to return the phone. I may come back to Moto X (2015) next year. Can anybody give me a solution to get my phone out of system recovery 3e?